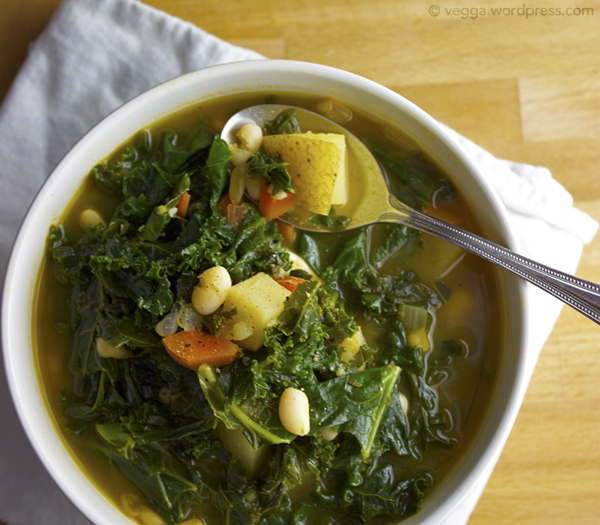 Years and years before kale was thrust into the spotlight by foodies in search of the next food superstar, my mama started making a kale soup that my entire family loved. I thought of that soup today, the first chilly day of the year, and knew I needed to make it. Kale soup, of course, is nothing new, and I do feel silly posting a recipe for something that’s as simple as simple can be. 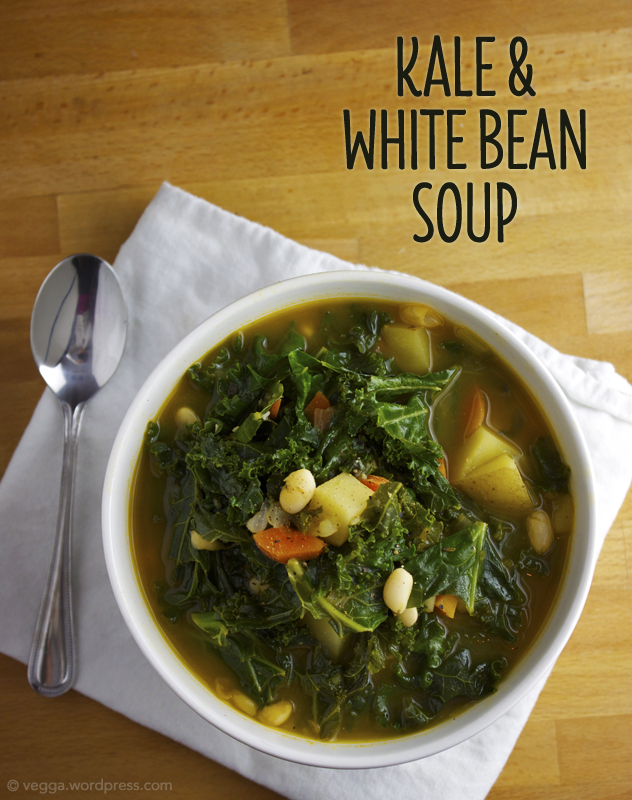 But if you have yet to discover the combination of kale and white beans, this soup is for you. Heat the olive oil in a large stockpot over medium-low heat and add the garlic. Sauté for about 30 seconds, then add the onion, celery, and carrots. Cook for about 5 minutes, or until the onion is translucent. Add the potatoes and spices and give everything a big stir. Add the vegetable broth and turn up the heat to medium. Bring the soup to a boil, then reduce heat to low and simmer for 15-20 minutes or until the potatoes are soft. Add the water or additional broth Add a big scoop of kale and stir it in; after it wilts a bit, add another big scoop. Repeat until you’ve added all the kale. (Or you can just add it all in at once if your stockpot is big enough!). Add the beans and cook for another 10-15 minutes or until the kale is as tender as you like it. Add salt and pepper to taste and serve! My version of Mom’s kale soup uses a spice blend similar to that you’d find in chorizo, giving it a smoky, spicy flavor. But you can switch up the spices based your tastes. Like most soups, this one is endlessly versatile. You can also add and remove many of the ancillary ingredients. No celery? No problem. Feel like adding some bulk? Throw in some orzo or quinoa. In a rush? Use Trader Joe’s bagged kale; just pull off the larger stem bits. You could even reduce the spices and add some soyrizo. Mom’s kale soup is, unsurprisingly, ridiculously healthy. A serving gives you 17 grams of protein, 18% of your recommended daily value of calcium, and 29% of your RDV of iron. You’ll also get lots of vitamin A and vitamin C. Thanks, Mom! Wow, we are on the same page! Thank you SO very much for the feature. And happy Navy Beans Day to you too! Yum yum yum!!! This will be perfect for autumn. I could go for some of this right now. Definitely bookmarking! I’m happy I have leftovers for lunch today!